Blue, and yellow Pro Europe Button Badge. Britain Voted to leave the European Union but you can let the world know you voted to Remain & are not part of the leave campaign. 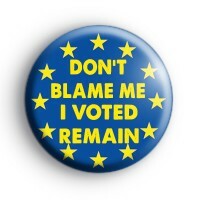 Are you unhappy and disappointed with the result of the recent EU Brexit Referendum & want to Remain part of Europe then you need some Pro EU Badges to show your support for a peoples vote.